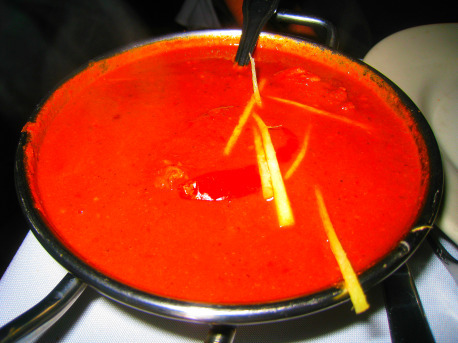 Phaal is a curry that’s spicier than vindaloo. Big deal. 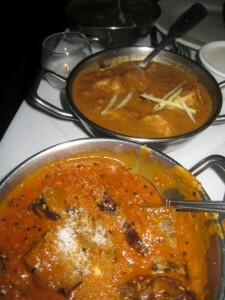 I order my vindaloo two ways: extra spicy, or “as hot as you can make it”. Granted, I thought there was a decent chance that Brick Lane would use some sort of habanero extract in the dish, but still I thought: there’s no white guy out there with a greater tolerance for heat than me. No mofo is going to film himself squirmming on his little TV show and act like he just climbed Mt. Everest. Not without a challenge from me. I always felt like, as a non-Asian, I would basically have to insult the chef to get something as spicy as I want it. Something along the lines of: “Your chef doesn’t have the balls to make it as spicy as I want it!” Clearly, no insults were necessary here. After sitting down, I noticed an Asian guy at the table next to us who was apparently in the midst of finishing his phaal curry. I knew because this was a man in pain. But I didn’t see a lot of eating going on. Just pain, and what looked more like an act of recuperation. His male friend next to him, and the woman across from him, had strange expressions on their faces. They had slight smiles, but there was also something resembling pity. Like he had just placed second in his first violin recital. When the group left, we saw that he never received his certificate of phaal survival. The man was beaten. What I had witnessed must be the closest I’ve ever come to seeing what it looks like when an Asian son dishonors his family. India: 1. Korea: 0. Brick Lane Curry House: on the threshold of the abyss. This is a sentence that would soon reveal itself as far more profound as it first sounded. Little did I know. Eggplant... and some other wimpy curry. So, I picked chicken, my wife got some random, unnamed, wimpy curry, and we picked an eggplant dish to share. Another diner sitting behind me, who was in the midst of his completion of the phaal (a successful attempt, I might add), recommended that I order a side of yogurt sauce. Confident I wouldn’t need such a crutch, I immediately ordered it. There was no harm having a little yogurt on the side. Just in case. A few endless minutes passed, reminding me of the start of a high school cross country race. Adrenaline was beginning to flow, and I was ready for the pain. Then the phaal arrived. It was much more innocuous looking than I expected. When the waiter had said, “It’s all about the sauce,” I didn’t know I was supposed to take him literally. What he really meant was: “Your pain doesn’t count unless you ingest every last spoonful of phaal sauce.” I guess I wasn’t paying close enough attention in Man v. Food. You mean I have to drink the sauce, too? Jesus. Ok, get me a spoon. My wife had two small tastes and gave in to the heat. I tried one piece of chicken and said “no problem, I can do this”. She was the smart one. The hottest dish I had eaten previously was an order of buffalo wings in a place called Cluck U. in Newark, Delaware. They had what was known as the “911 Challenge”, which relied on a recipe using habanero pepper extract. What I noticed during that masochistic experience was that the heat eventually plateaued after three or four wings. There was no such plateau this time. The last seven or eight bites were the hottest and most painful. Until then, it kept getting hotter. The only qualification here is that I couldn’t resist the temptation to pause during my meal (sort of like a normal human diner might do). Each pause, while allowing some relief for my tongue, also likely increased the heat in each subsequent mouthful of pepper sauce (the stuff with the chicken in it). So, the experience, clearly, is meant to be had only once. It’s all pain, and no gain. Go on, eat your naan. No one's gonna call you a cheater. Oh, did I mention the flavor? I’ll say this: it wasn’t bad. It definitely didn’t seem to be simply pepper extract, but as my wife pointed out, had a slightly burnt quality to it. The flavor actually resembled black pepper more than anything else. After I finished more than half, though, the flavor began to get tedious. And the consistency, which started out only slightly gritty, became more pronounced. An amusing stunt quickly became a job to finish. Contrary to the above mentioned 911 Challenge, I was allowed to eat other food with the phaal, which helped. 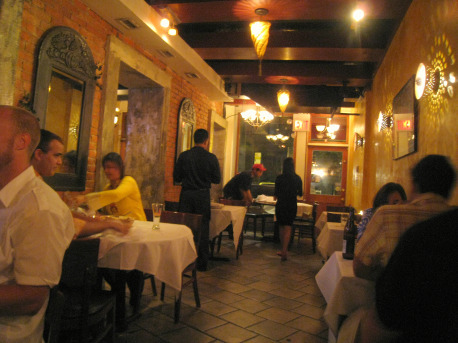 Rice, naan, napkins, candle wax, all of the above. And did I use the yogurt sauce? Hell, yeah. It helped, but unfortunately for my tongue’s nerve endings, couldn’t come close to neutralizing it. Did I finish the phaal? Yes. After all, it’s only pain. The hardest part might actually have been fitting the volume of sauce into my stomach. (Granted, the mistake might have been the dozen raw oysters I had consumed earlier in the evening.) Nevertheless, I stand by the statement that the pain was fun. “Fun”, to use another cross country reference, in the sense that a distance race is “fun”. For some reason, you just don’t seem to recognize all that fun until the pain stops. For those who need proof. And did I use the yogurt sauce? Hell, yeah. It helped, but couldn’t neutralize it. I just ate it tonight and finished. It is now 6:20AM and I still haven’t even bothered trying to go to bed b/c I’m shitting my brains out every 30 minutes or so. In and of itself it was not the hottest thing I’ve ever had. I’ve had wings that were just as hot if not hotter and I’ve had fresh peppers that were definitely hotter. The difference is that I’ve never had eaten the sole source of heat in that volume before. Sure the wings were hotter, but it was only the very thin coating of sauce baked onto the skin and meat that was hot. Likewise, I never ate 16 oz of chopped fresh Habanero or Scotch Bonnet. The actual mouth burn isn’t beyond anyone who regularly eats really hot stuff. If you put Dave’s Ultimate Insanity sauce by the spoonful into your chili or on your pizza you’ll be fine. It’s the extreme dissatisfaction that your stomach registers within the first 10 minutes of the first bite that kills. The fact that the dish is not really meat or vegetables with a hot sauce on top, but rather 16 ounces of a very hot sauce with 4 bite size pieces of meat thrown in for good humor is the killer. Ok gotta go have another reckoning with the porcelain god. You’re right that having to consume the sauce was the catch that you’re not prepared for and what really makes things difficult. Still, I think the dish was the hottest I’ve eaten. You have to understand that I don’t count Dave’s as a legitimate food product. I’ve only had his Temporary Insanity Sauce, and I’m assuming “Ultimate” is hotter. I’m going to take a wild guess that your comment about using it “by the spoonful” was hyperbole, right? I’ve never met anyone able to use the stuff as an actual sauce. I have bitten into a raw habanero, and yes, that was hotter than the phaal. 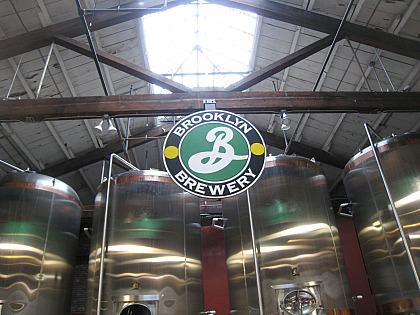 Here’s a Wall Street Journal article about the Brick Lane phaal craze. 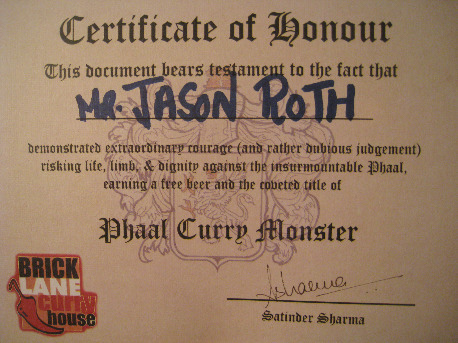 Photo of official “Phaal Curry Monster” certificate added. Watching Food Network’s “Chefs Vs. City,” one of the challenges they just had to do was eat a bowl of Phaal at this very establishment. It sure as hell didn’t look easy (and they washed down every mouthful with some high-fat frozen mango beverage whose name I didn’t catch). Congratulations on your accomplishment and certificate! Must have been a mango lassi. 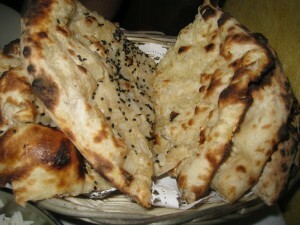 I ate plenty of naan bread. Brick Lane is actually kind in this regard. In some of these challenges, like one for spicy chicken wings I did in Delaware, they don’t let you eat or drink anything else. In the one in Delaware, I actually had to wait ten or fifteen minutes after eating the wings before I was “allowed” to drink anything! Next post: Making Reservations? Put Your Money Where Your Mouth Is.